The emergence of fragment-based approaches for the discovery of enzyme inhibitors is one of the most exciting recent developments in early stage drug discovery. Pioneering work, notably in Astex Pharmaceuticals (co-founded by Professor Chris Abell, Professor Tom Blundell, and Dr Harren Jhoti) has rapidly developed this technology to deliver lead compounds more quickly, reliably and at lower cost than more established approaches [Nature Rev., Drug Discovery 2002]. We are now developing these techniques for the discovery of molecules that inhibit key enzymes in M. tuberculosis, and exploring the possibility of using similar approaches to disrupt protein-protein interactions in potential oncology targets. (a) Preparation of a suitable form of the target enzyme: The fragment-based approach to screening uses biophysical methods to identify fragments that bind to the target protein. These techniques require significant quantities of pure, soluble protein. 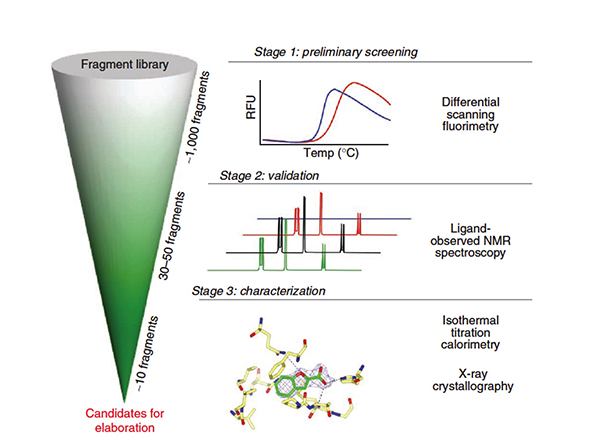 A further requirement for screening using X-ray crystallography is the availability of high diffraction-quality crystals of the unliganded target protein, which are robust enough to be soaked in the presence of fragment cocktails. (b) Assembly of fragment libraries: Fragments are small molecules with a molecular weight typically < 250 Da. Fragments need to be soluble enough to allow screening at millimolar concentrations due to their inherently weaker affinities. We screen with libraries of a few hundred compounds depending on the screen being used. (c) Fragment screening: The starting point for our fragment-based approach is the identification of fragments that bind to the target protein and the characterization of their binding interactions. The molecular properties of fragments present specific experimental challenges. Their weak affinities are often outside the detection range of bioassays, we consequently use biophysical methods to detect fragment binding. We use a growing repertoire of techniques, the most important are thermal shift, NMR spectroscopy, isothermal titration calorimetry (ITC) and X-ray crystallography. (d) Growing fragments into lead compounds: The structural information from an X-ray screen is the starting point for the elaboration of a lead compound. The fragment binding orientation is used to decide how to grow the fragment, guided by in silico approaches. Once a course of action has been decided, the process involves incrementally building up potency of compounds in a series by optimally exploiting interactions at the active site. A larger molecule is synthesised that incorporates the original fragment, and the structure of this molecule bound to the enzyme is determined. There then follows iterative cycles of medicinal chemistry, guided by structural studies. This involves close collaboration and coordination between the X-ray crystallographers and the synthetic chemists. Once compounds of sufficient potency have been synthesised, the activity of the series is also tracked using enzyme assays. For an example of our fragment-based approach to the discovery highly potent inhibitors of thrombin, please follow this link: [J. Med. Chem. 2006].